A dental crown, or cap, is a tooth-shaped cover, placed over the visible portion of a tooth. 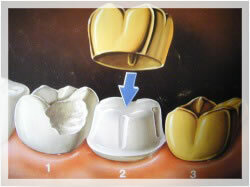 A dental crown is cemented into place and fully covers the tooth. Much like veneers, dental crowns cover imperfections in your smile. Crowns are generally used for more severely damaged, or discolored, teeth. The main difference between a crown and a veneer is the amount of tooth each covers. Crowns cover the entire tooth, while veneers cover only the front surface of a tooth. Another difference is in the thickness of each - crowns are much thicker than veneers. Crowns require more tooth trimming, and this process is not reversible. A dental crown is much like a natural tooth, and requires the same maintenance. Please note: Temporary dental crowns require more maintenance and care compared to permanent dental crowns. Please contact us for more information. You may be considering dental crowns if you have a tooth that is weak, discolored, or worn. Dental crowns can also aid in other dental procedures, such as bridges, fillings, implants, or cosmetic modifications. Think you're ready for a dental crown? Give us a call at 419-836-1033 to schedule a consultation or contact us online. To ensure a dental crown is the right solution for you, Drs. Jody and Matt Freytag invite you to join in a consultation before anything is decided. After deciding whether a dental crown is right for you, the next visit is to examine and prepare your tooth. During the exam, we'll check your teeth and overall oral health to prepare for the procedure. Your dentist will reshape your tooth and make an impression of it. This is done so that they dental crown fits to your bite, and fits properly. A temporary crown, made of acrylic, is then made and put in place while your permanent crown is made at a dental lab. We will fit your crown to your tooth, and ensure everything is comfortable and correct. We'll ask for a follow-up visit to check on your new crown after a few weeks.